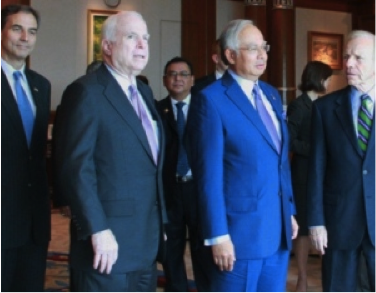 Senators John McCain and Joe Lieberman’s recent visit to Malaysia did more harm than good. According to local media reports, Senators John McCain and Joe Lieberman, who came visiting recently, expressed their admiration for Malaysia’s democratic model and even went so far as to suggest that it might serve as a template for other Muslim countries. There was only the barest hint of reservation during their press conference when they made vague and passing references to foreign election observers and further democratic reforms. It may well be that they raised democracy and human rights issues with Prime Minister Najib Tun Razak and Foreign Minister Anifah Aman when they met in private but it is their public positions that are disturbing. First, though they must surely have learned from their meetings with the Leader of the Opposition and other civil society groups about the real and serious challenges to democracy in Malaysia, they chose not to reference these issues in their public comments. Their silence concerning the deeply flawed electoral system, restrictions on the media, and on public gatherings and the absence of a lot of other democracy essentials is troubling. Unsurprisingly, the senators’ comments were immediately taken as American endorsement of both the government’s reform agenda and Malaysia’s governance model. Their comments were even absurdly stretched to suggest that Malaysia’s political system might even be superior to that of the United States. Second, they saw the gleaming towers and shiny limousines and were understandably impressed. There is, after all, much to be impressed about Kuala Lumpur. To them it was probably a vindication of the free enterprise system at whose altar Americans love to blindly worship. Did they, however, also learn about the massive corruption, the system of crony capitalism and the exploitation and abuse of migrant labour that fester beneath the surface? If they had, they might have been more nuanced in their assessment. Thirdly, their comment that Malaysia could serve as a democratic model for other Muslim countries is both condescending and insulting. Malaysia is, at best, a quasi-democracy. Our democratic space is already diminishing rapidly as a result of increasing limitations on press freedom, free expression and public assembly. Is this the kind of system that should serve as a template for democracy in other Muslim countries? Are the senators suggesting that this is the best that we are capable of or that the world expects no more from Muslim countries? Why shouldn’t all governments, east or west, secular or religious, developed or developing not be expected to live up to minimum standards of freedom, human rights and good governance? Whatever the honourable senators might think, they should know that the flawed political system that masquerades as democracy has been found wanting by the people of Malaysia; just ask the tens of thousands of people who thronged Merdeka Square in April. By endorsing this stunted quasi-democratic model and, indeed, promoting it as an example to the Muslim world, the senators did a great disservice to the struggle for freedom and democracy everywhere. The problem with all too many American leaders is that they tend to view everything through the prism of their own narrow interests. For so long as foreign rulers toe the American line, buy American weapons and keep their markets open to American businessmen, they can do no wrong. American leaders get excited about freedom and democracy when it suits them but turn away when it is inconvenient. The principles and the ideals of their own constitution apparently are not heartfelt enough to be incontrovertible always and everywhere. At the height of the so-called war on terror, for example, US senators and congressmen regularly trooped to Putrajaya to praise the way the Mahathir Administration dealt with suspected Islamic terrorists via the Internal Security Act. One senator even lamented the absence of ISA-like legislation in other Asian countries. The fact that detention without trial is contrary to the most basic principles of justice and that it was used to silence critics was conveniently ignored. I recall, as well, a meeting with then Secretary of State Colin Powell in mid-2001 at the State Department in Washington, D.C. Much to the chagrin of our foreign minister, Powell began by taking us to task on human rights and anti-Semitism. However, to our minister’s relief, Powell quickly shifted track and then excitedly went on to talk about the sale of the latest American fighter jets to Malaysia. It was immediately clear that he had raised the issue of human rights and anti-Semitism purely for the record, and without conviction. The silence of Senators McCain and Lieberman concerning our struggle to build a better democracy in Malaysia is hugely disappointing. Worse still, their naive and ill-considered endorsement of Malaysia’s flawed and stunted governance model is a betrayal of the very ideals that America claims to champion across the world. McCain and Lieberman are like two of the three monkeys who see no evil and hear no evil. By leaving out suggestions for the improvement of governance in Malaysia they do, however, speak evil by omission.